OneDrive Brings Unlimited Cloud Storage For Office 365 Users. Has It Killed The Market? As per various estimates, Cloud Storage market is estimated to be worth $8 -10 billion right now, with growth projections of $60 billion+ in the next 5 years. But a recent offer from Microsoft for OneDrive has literally sabotaged the whole industry: Unlimited storage. Previously, 1 TB was the maximum cloud storage they offered. Microsoft has unleashed their new offer without having too many budget considerations as all the existing customers of their Cloud Storage services would benefit from this upgrade. 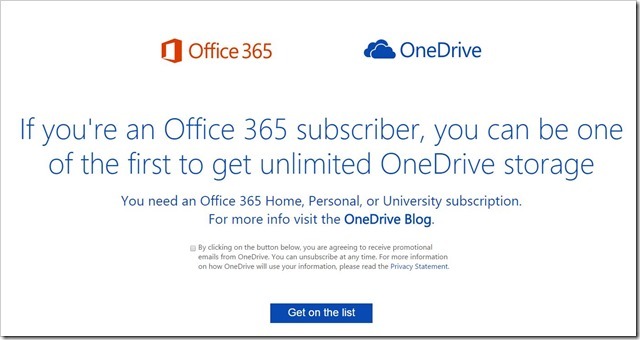 Users of Office 365 Home, Office 365 Personal, and Office 365 University plans would be immediately upgraded, followed by the rest. In case you are an existing OneDrive customer, and you are not patient enough to wait longer, you can simply get into the list here. And, there would be absolutely no additional charge for this upgrade. The minimum plan which OneDrive currently offers is $7 / month, and all customers who have this or any other plan will get unlimited storage. What next? How much space can you actually offer after unlimited cloud? Some analysts have already declared that the Cloud Storage industry is now almost dead. However, the most interesting part of the whole Cloud Storage market is that, it’s dynamics are completely different from any other market. Dropbox, Google, Box and other big companies in this niche exists solely because they are special in their offerings. As Venture Beat mentions, the three core factors which matter the most while deciding the vendor: Security, Mobility and Collaboration still hold true. None the less, Microsoft has certainly opened up a new front, and created a new benchmark for other Cloud service providers. It would be certainly some anxious days for other major Cloud players. Will you choose Microsoft for it’s unlimited storage offer or choose Google because of it’s impeccable collaboration platform or opt for Dropbox for it’s mobility and flexibility? Global Smartphone Market Share: Xiaomi Grows 211%, Now 3rd Largest After Samsung, Apple!